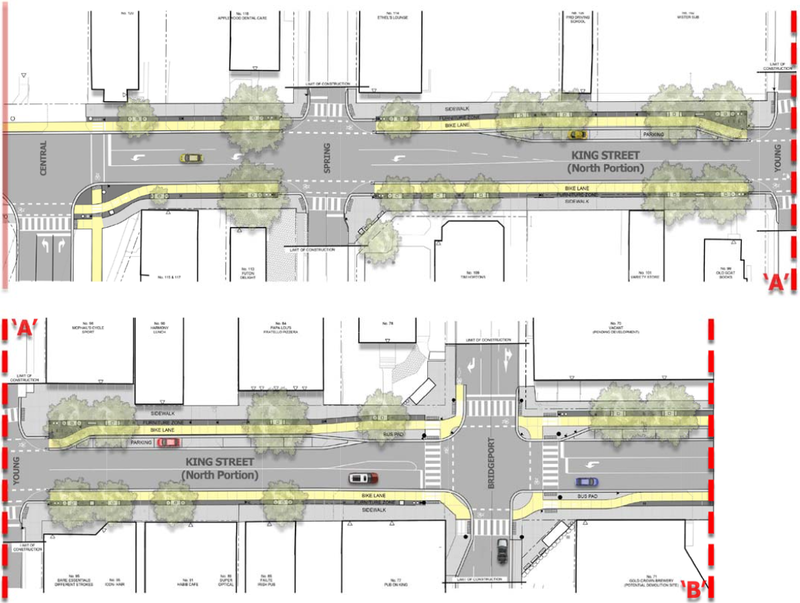 The latest iteration of plans for reconstructing King Street in Uptown into a walking and cycling friendly place are up for your perusal and feedback. Take a look and provide your comments soon! 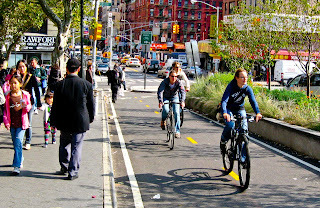 Protected bike lanes providing destination access to all levels of cyclists. 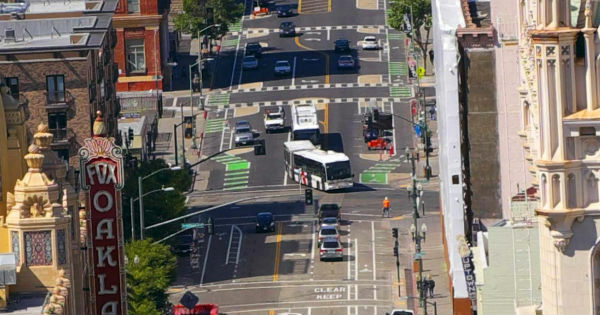 There's other great features in here too: some protected intersection features at Erb and at Bridgeport, and positioning of bus pads and parking on the street side of the bike lanes, which limits dooring and blocking potential. It's encouraging to see this plan, particularly as evidence mounts of the positive safety impacts and economic benefits that come from humanizing our downtown spaces. Walking up. Cycling up. Business up. Collisions down. His word for this plan was "myopic". He claimed that King needed to be an arterial road in order to maintain heavy truck access for these businesses to function, and he talked at length about a situation in Cambridge where a semi got stuck in a bad turn and couldn't reverse due to backed up traffic. It's not that he doesn't have a point. But he was trying to paint these points as deal killers or catastrophes, and they are not. They are simply inconveniences that are worth bearing for the benefits we'll gain. Here's why. King was built as a four-lane arterial, which (along with Bridgeport and Erb) has resulted in a tremendous amount of through traffic passing through Uptown. Some business owners have seen this as their lifeblood, but through traffic doesn't tend to stop. Crushing the pedestrian realm to move cars faster. Instead, the traffic volumes make Uptown an unsafe location for people on foot or bike. I'm recalling the death of a student in the heart of Uptown in 2012, but there have been numerous other fatalities along King St. (edit: including, tragically, one today.) In these cases, blame gets apportioned to one party or the other but the cause of death is the same: speed. Speed comes from wide roadways, and wide roadways come from this myth that we need to route cross-town traffic through our dense cores at the expense of all other road users. Which makes these places more dangerous, less pleasant places to be, which in turn hampers their economic potential. 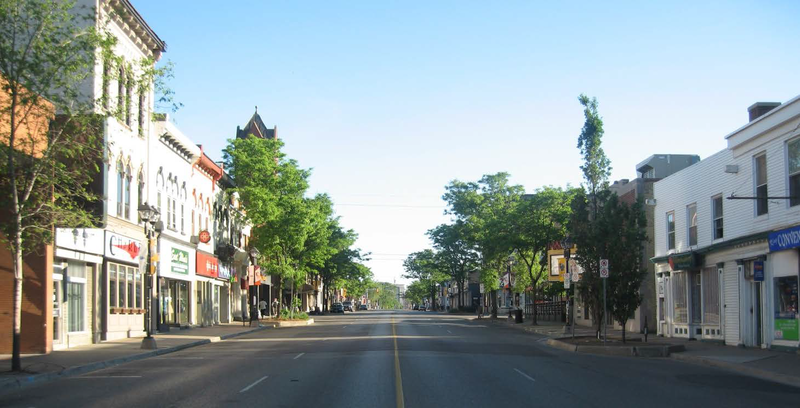 King street is a city street. Its job isn't through traffic, it's destination traffic. Drive it if you want to go to Uptown. If you're travelling a long way by car, then use Weber, or Westmount, or the expressway. Loading and unloading can still happen, it just might take a little more thought. Firstly, most of Uptown's King St. businesses have rear access. Laneways and rear parking exist for everything between William and Erb. That room should allow for most traffic to filter around the occasional unloading vehicle. But if not, there are other steps that can be taken. Early or late deliveries can take advantage of available on-street parking. And smaller delivery vehicles can be used. Does Tim Hortons need to be serviced by a semitrailer? If downtown Toronto Tims can get their supplies, so can Uptown Waterloo's. These are inconveniences, but if Uptown becomes a more attractive destination for people to visit, then businesses will find ways to overcome obstacles to better serve a growing customer base. There are a lot of new homes being built along the central corridor, and with the arrival of LRT, Uptown Waterloo is well positioned to serve the needs of these residents arriving on foot, transit, or bicycle. And those residents will need to be able to rely on those modes of travel. We're learning that sprawl and car dependence results in a massively expensive and unsolvable traffic problem: you just can't build enough road and parking to satisfy demand without inducing even more, and the very act of trying will kill any human-friendly space as well as our municipal budget. So instead, intensification needs to support walkability, and good transit and cycling options provide excellent access for people to the destinations they seek. The Uptown plan shows how to do just this. An improved, safer pedestrian realm. Regional transit improvements enabling frictionless travel along the corridor and improved cross-town travel. Bike lanes to allow for "a little too far to walk" trips in speed and comfort. It's the kind of city I want to live in, and I hope you see the value of it too. If that value appears to introduce some automotive inconveniences, it's only because we're used to planners trying to make driving easier at the cost of absolutely everything else in our lives: walkability, our safety, cost, and even our health. This plan is what getting priorities right looks like. "When you build for people and places, you get people and places." Great analysis! I hope the city and region work towards finding an effective solution for delivery trucks north of Erb Street. It's annoying to see delivery trucks stop and park on the King Street LRT tracks between William and Willis Way. Where did they stop during construction last year? I was talking about it with my barber, who is located there. He thinks Hughes Lane is not wide enough to handle the delivery trucks. I think it's simply educating the delivery drivers, some of who may be new to the area, or have a new delivery route and are not aware of the laneway. I hope this problem is resolved quickly before the LRT vehicles begin testing and before service begins. 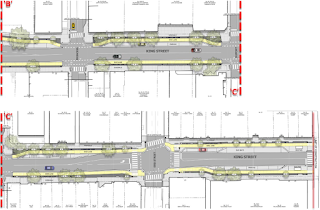 I am very excited for the new streetscape, and the protected intersection is especially exciting. I hope we are past the point where people such as the "well spoken gentleman" can derail this project through fear of change. Can't wait! This sounds like an amazing improvement over the current configuration. I am wondering about emergency vehicle access. The lrt construction eliminates any possibility of drivers being able to squeeze over to allow emergency vehicles to pass, this proposal will have much the same effect. How is this being addressed. I would also like to point out that a lot of traffic is avoiding the core and causing traffic increases on Weber and Margret. Margret has already been narrowed as well as many of the residential streets between them. There has been no decrease in the speed on these streets. I waited for the news of todays cyclist death on King. Shame on you for using the death of another person to further your agenda, especially your comparison to downtown versus King at Hwy 85. Disgusting! I won't apologize for bringing these incidents up to further an "agenda", considering that it's the very safety of people using King on foot or bike that is my goal. I'll welcome your constructive participation in this discussion, but manufacturing trollish outrage with a ridiculous anonymous post isn't going to sway anybody. On the assumption that the two anonymous posters in this thread are different I want to address the question about emergency vehicles. Firstly, the authoritative people to ask about this are in the consultation document link at the top of this post. However I'll note that they're keeping extra room on the lanes through uptown to allow room to get around the occasional stopped vehicle. Also, the bike lanes will have rolled curbs on them, allowing for vehicles to temporarily pull off further. As for what happens on King south of uptown with the train tracks, the rapid transit project team has said that vehicles are meant to keep moving if an ambulance is behind them and they don't have room to pull off. There's a reasonable worry that people won't immediately understand this... However the light rail right of way is also available to emergency vehicles (something always intended in the plan.) We'll see how well this works. There are other steps the RT staff are prepared to take if they need to improve the situation. I would also add re: speeding on Margaret. The city and region measures speeds on these roads regularly and the narrowing (despite being only paint, which is less effective than curbs) has produces a measurable reduction in speed. The specific changes have been published in a few staff reports, which are publicly available. As for Weber, absolutely it is carrying more traffic now. This was in fact intentional, and is the reason for the widening. It is intended to be the through street to carry the volumes of cars which don't need to be using King. Fear not, the region is well aware the for the majority of people, personal vehicles will continue to be the primary or only mode of transportation and is making significant investments there too. There is no "war on cars". 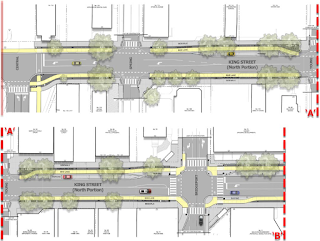 Chris, do you know if there are any plans by the region to make the missing bike lane connection on King Street North, between University Avenue and Weber Street? There's been much high rise development, especially between University and Columbia, yet the sidewalks are not any wider, the speed limit is still the same as before the increased density, and there are no bike lanes on King to connect to the multi-use trail at Weber. As far as I can tell now, there are no plans. Usually the region waits until the road is due for reconstruction before adding bike lanes, but I'm confident they will when this section finally comes up. 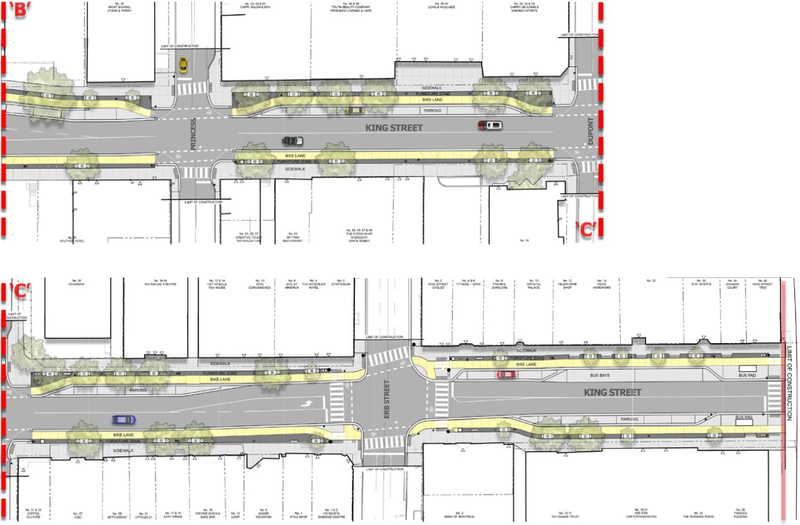 Once the protected bike lanes are constructed on King up to University Ave (I think that's not until '19 or so) people could try and pressure the region for quicker infill of the University gap between King and Weber.